How to Inflate an Air Mattress without a Pump? Everyone will agree that the best way to inflate your blow up mattress is using an external electric pump; nothing beats that! But what happens if the pump broke down or you forgot your pump at home? Don’t worry there are a few tricks that could help in no time at all. In this article, we have compiled some of the best ways that you can inflate your air mattress without necessarily having a pump. They are simple DIY options that may come in handy when you least expect. If your external mattress pump malfunctions, a vacuum cleaner could easily help. However, the cleaner must have a hose attachment to work. To use a vacuum cleaner, here is what you must keep in mind. Make sure your vacuum cleaner with a hose has no dust particles or debris. You can always run your cleaner for a while around the house or outside until you are certain that it is completely free of any debris. After doing this, take your air mattress and spread it out on a clean and flat surface. Then open up the valve and connect it’s nozzle to the cleaner’s hose. Adjust the vacuum cleaner’s hose until it gives you an airtight connection. If this doesn’t work, get down to your neighborhood hardware and buy an adaptor. This should give you the best connection to the nozzle and the hose. There are so many types of adaptors and I would suggest buying online too. Now set your vacuum cleaner in reverse mode. This will allow it to blow out air instead of sucking it in. At this point, your vacuum cleaner should be able to fill your air mattress in no time. When done, close the nozzle faster to prevent any air from flowing out and giving your mattress a flaccid touch. If you have an air mattress with no pump but have those regular hair dryers, don’t worry – you are covered. Unlike the vacuum cleaner, the air dryer is easier to use, however, it is not as effective as the vacuum cleaner. Meaning, it might take a little longer to fill up your air mattress to the required firmness too. However, when using an air dryer, there are a few precautions that you have to keep in mind before choosing your dryer as a pump for your twin size airbed. They include the following. Don’t Go With Hot Air: This will easily damage the seams of your air mattress leading to punctures and eventually the destruction of your mattress. Hot air will also cause damages to any areas of the mattress that are patched using duct tape. In short, you should set your air dryer on the cold air settings. 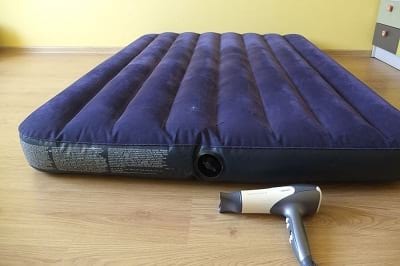 Once you have set it to give cold air, you should then connect your dryer to the air mattress nozzle and blow up your mattress to the required firmness. And once your mattress is set as required, you can then disconnect the dryer to prevent air loss. Garbage bags are also called refuse bags. It might sound a little crazy but it’s a great way to inflate your air mattress if you don’t have an external air mattress pump to work with. Refuse bags aren’t the quickest ways to inflate your air mattress but with a little patient, they will work just fine. If you intend to use a garbage bag to inflate your air mattress, here is the simplest way to do it. First, get a large and strong garbage bag. You need a large garbage bag in order to be able to catch a considerable amount of air at any given time. Take your bag and swing it around to trap air. Once the air is trapped in, you should then seal up the open end of the bag as tight as possible using your hand to form a huge air bubble inside the bag. Follow this by connecting one end of the bag to the valve of your inflatable air mattress – but don’t lose the tight grip. Then press the bag harder to allow the trapped air to rush into the mattress through the nozzle. You may need to repeat the process for over 10 times to get the required firmness. That’s why I said you need patience. Always close the valve immediately you push in the air to prevent any loss of air. If you do, you will love how trash bags work! The leaf blower isn’t a common method really. But as it stands, it works pretty fine too. Leaf blowers usually blow out air and that’s why using them become really simple. To use a leaf blower you would need to be patient too. Leaf blowers will waste so much air and only allow a little to go into your mattress at any given time. Because of this, it might actually take some time to get it done with. To use a leaf blower to inflate the mattress, here is how you do it – no expertise required at all. Place your leaf-blowers outlet on the air mattress nozzle/ valve. Release the blower to blow in the air into your mattress. It will take a while, but it should fill the mattress with time. Remember, it is a slower process than a vacuum cleaner and much slower than an air mattress pump but all the same it still works much faster than a refuse bag. Blowing up your air mattress without a pump may seem like a tricky affair – well it is. However, with these tricks that we have given you here, you might be set in no time. You don’t have to worry anymore. Get that air mattress and hit the road to camping. No need for that generator set anymore.